Dude's got skills!! Those are going to be drop dead gorgeous. Come on Will this ain't your first rodeo. I bet you could rig those tweeters using hand tools after a few adult beverages and blind folded no problem. Who you kidding. Great workmanship so far. Looking forward to seeing the finished product. Although sight is but one of the aspects of those beuts. Those look real nice! The corners are perfect and hard to do. Can't wait to see a finish on them and for the grain to pop. What are you going to use? I'm with you, I want to see these pop. There are all sorts of finish options. I like to keep it simple and see the wood without stains and color. 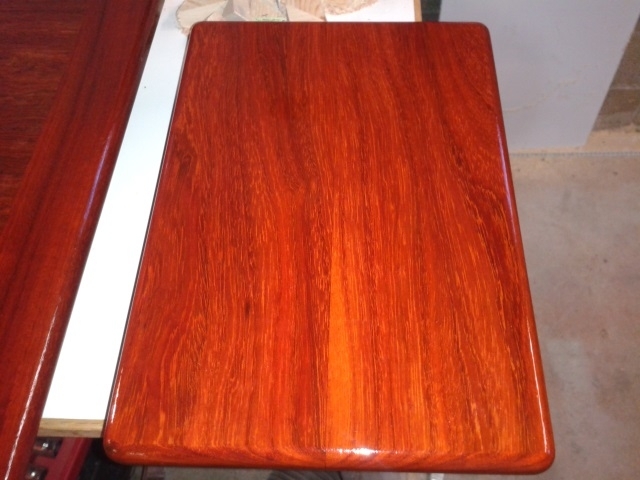 I use a straight tung oil, rubbed on in several coats. You can finish from a dull mat to a french gloss. Just depends on what you like. I'm shooting for a satin to semi gloss finish. It brings out the grain and darkens to a wet look. Just started the first coat. I like what I'm seeing. The mitered corners are very difficult, especially biscuiting accurately on a 45! One thing I have learned from working with MDF, you need to take caution in tightening clamps. MDF will crush. Thank you! Beverages after the ripping is done, a prerequisite to woodworking, especially the sanding. I like to keep it simple and see the wood without stains and color. Me too, I don't like using stain and it drives me nut when people stain hard wood. Let the natural color come out. Sorry, but nothing makes the grain of wood pop like a dye and a film coat. 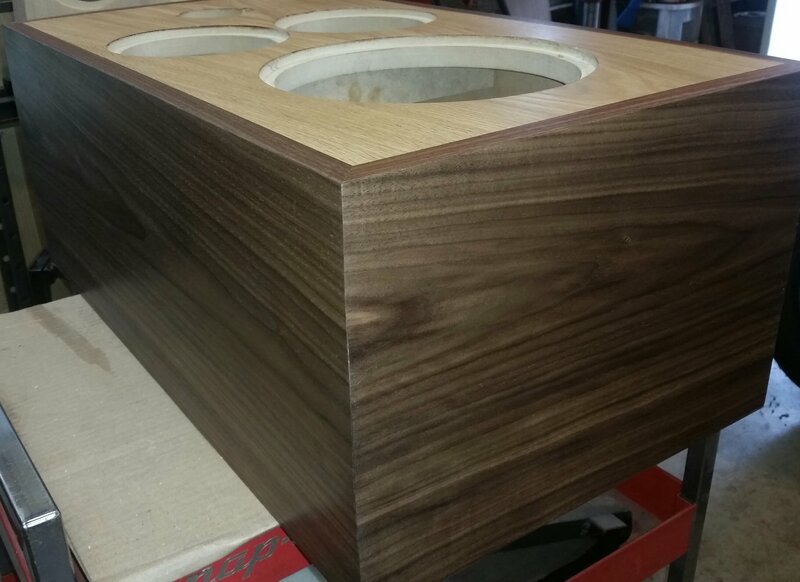 New walnut is cold, it needs to be warmed up. Like it is with most trades, it sure pays to have the right tools. Beautiful work there. Oh my......the contrast looks great! The type of finish has everything to do with how the wood looks and I am not talking about stain. 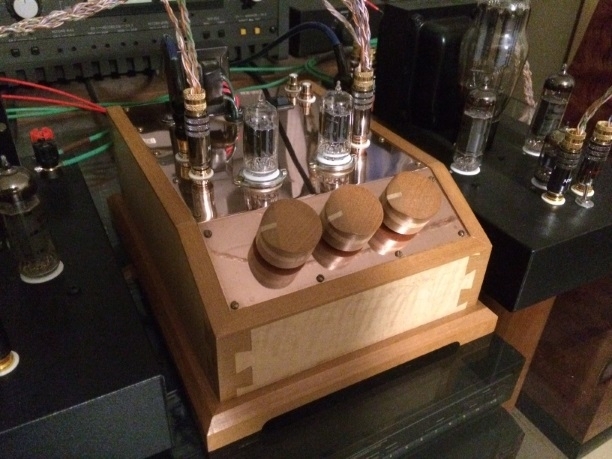 I once ruined (well not ruined but not the look I was going for) a pre-amp box I made. I used Bloodwood and maple for the box. At that time I did not know finishes too well and used a poly to finish it. 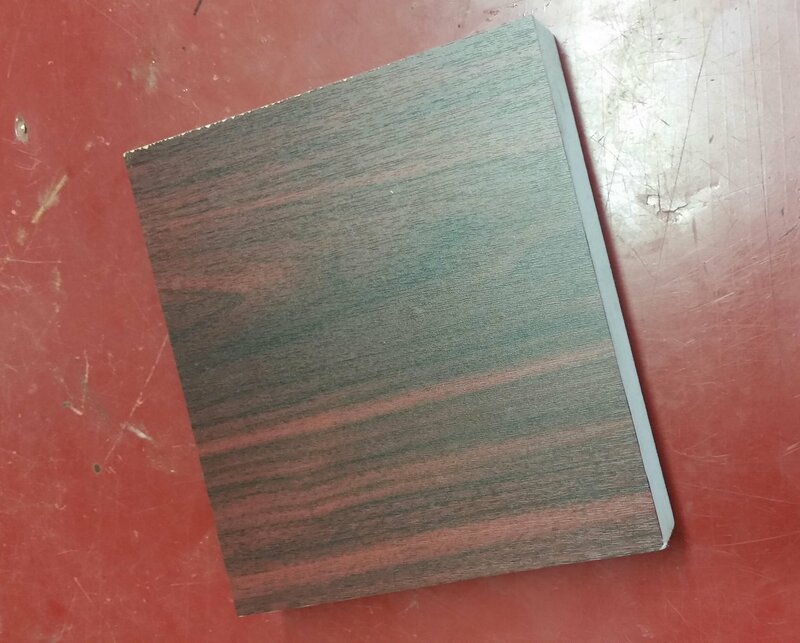 The blood wood turned brown. 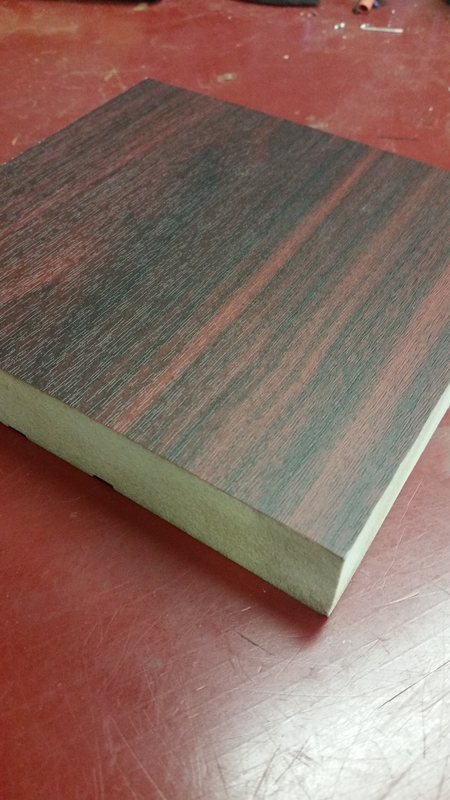 If you know Bloodwood it has a nice deep red to it. While true that the type of finish and the sheen have an effect on the final appearance, it's not everything. Poly should not have caused that to happen. What brand, wiping or brush, how old was it? Not sure about the brand name but it was a quality brand, not a no brand name from Walmart. It was a brush on and I think it was water based. I know what you are saying, I was not expecting that color either. I just know certain finishes go deep into the wood to bring out the beauty. I never had Walnut look cold. 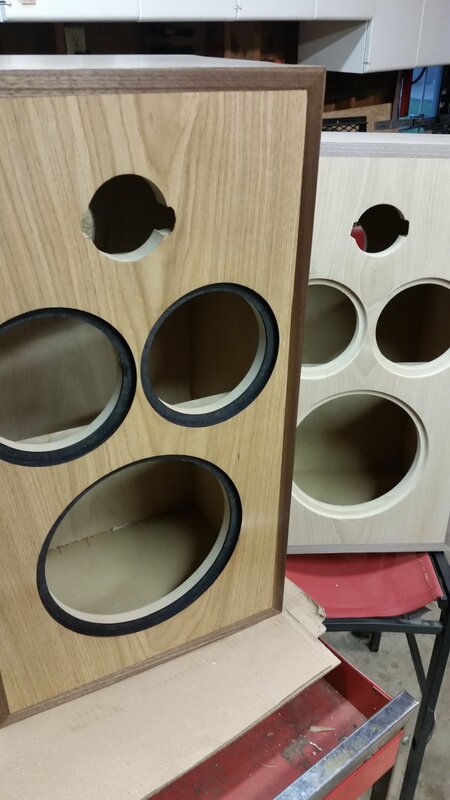 Now back to speaker building. Let see some more pictures. I think it was water based. There's the problem. Water borne finishes have gotten better, but still aren't there. Not unlike fluorescent compared to incandescent lighting. I do not use water borne finishes, won't even consider them. I never had Walnut look cold. The walnut in willwilly's pics is cold. Will, I would be remiss if I didn't say your craftsmanship is top notch. Great job will. This entire thread makes me smile. Well a bit of bad news, using one of my MW6503'S in the shop to test fit holes several times, being passed around with visitors... even having the JB weld treatment on the top plate, the driver locked up. I see the logic in the JB weld technique, but make sure you do it on the top and bottom side of the magnet... Mine were done on just the top edge of the magnet. So if anyone has a good 6503 laying around, I'm interested. I have yet to abandoned a resemblance of a budget, or I would buy four new drivers. So while I'm waiting for the last coat to dry, this is a sample I put together of 1" MDF. I have been researching vinyl wraps to see what is available. 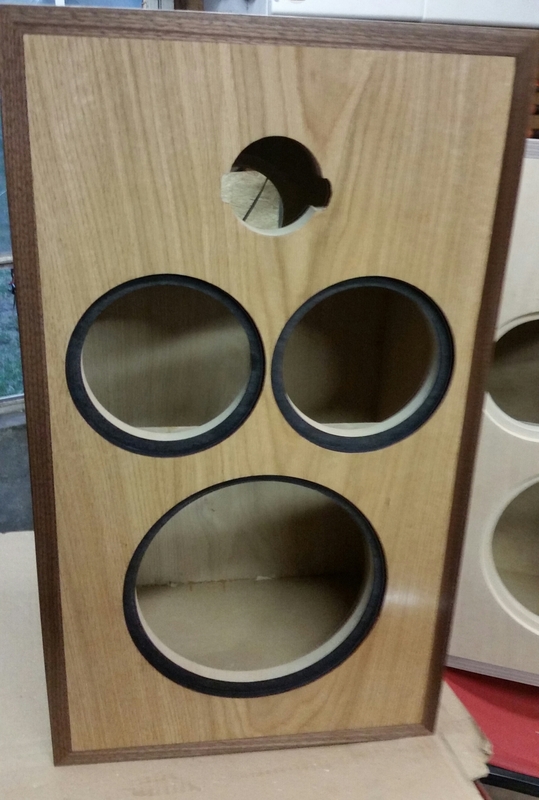 These wraps can be pricey, and make any wood worker gag, but...for a speaker, handled properly, vinyl may be an acceptable option. Did I say that out loud. This reminds me of bloodwood. This is my Garage system. I using two 5jrs' and 4's. 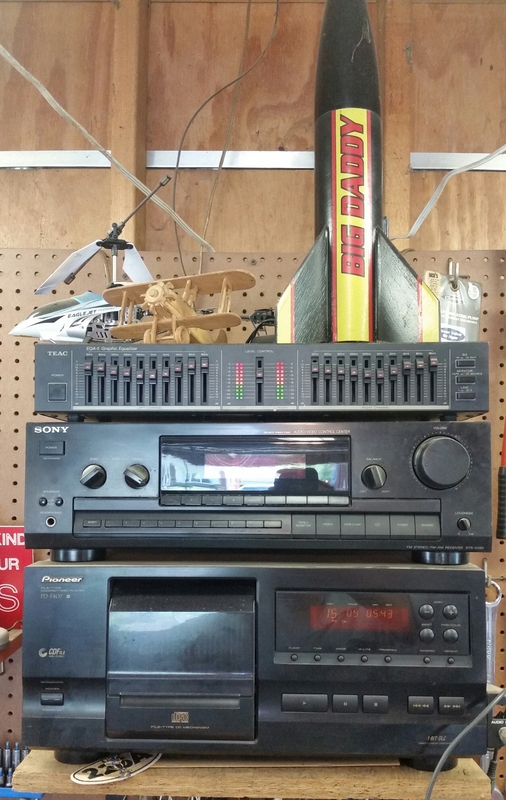 I'll be using a Denon AVR5700 to drive my 10's. I link to the vinyl product would be nice.